I'm intrigued by the 'Getting Personal with Tom Thomson' feature on your website - i.e. Thomson's connections with John McRuer et al. I have an obituary of McRuer from the Huntsville Forester, but I'm still in the dark about how the two men originally met. 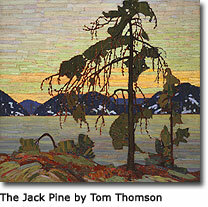 Like many of Thomson's works, the subject is in Algonquin Park. I loved working with the White Pine team on West Wind: the Vision of Tom Thomson which won five documentary awards in 2012. 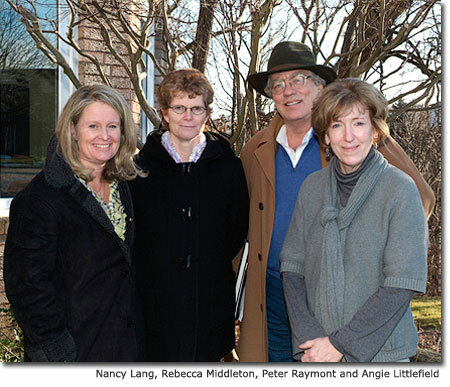 I've stayed in touch with Rebecca Middleton and Nancy Lang researchers extraordinaire! In 2015 White Pine continued their focus on the artists who worked with Tom Thomson with Painted Land: In Search of the Group of Seven. The television broadcast premiere of Where the Universe Sings: the Spiritual Journey of Lawren Harris is June 25, 2016 at 9 pm ET on TVO. Both Nancy and Beck have already supported the research for my upcoming book on Tom Thomson: A Fine Kettle of Friends: Tom Thomson eats out. White Pine Pictures released a great new documentary about Tom in 2012 in which I played a small part. Research from The Thomsons of Durham and from Tom Thomson Toronto Neighbourhoods was used by the dynamic White Pine Pictures team. Director Michele Hozer, film maker Peter Raymont and researchers Nancy Lang and Rebecca Middleton so inspired me that I started research on a thematic biography I’ve tentatively titled Over Easy: Tom Thomson Unlike You've Ever Seen Him. White Pine Pictures President Peter Raymont, Nancy Lang, publisher of At the Ojibway and researcher extraordinaire Rebecca Middleton are well-started on what will be a stirring new documentary on Tom Thomson. They visited recently to explore the background research for The Thomsons of Durham: Tom Thomson's Family Heritage. 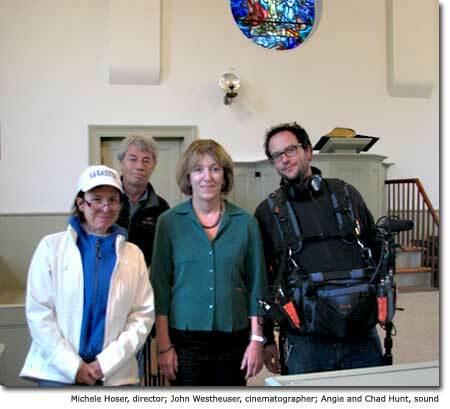 Their thorough research and award-winning ways are seen in documentary films such as Genius Within: The Inner Life of Glenn Gould (Toronto International Film Festival Official 2009 selection) and Shake Hands with the Devil: The Journey of Romeo Dallaire (2007 Emmy for Best Documentary). Keep posted for more information about the unfolding of this exciting project. Co-workers at Grip and Rous and Mann, artist/outdoorsmen such as Ben Jackson, Tom McLean and William Smithson Broadhead? Bosses, patrons and mentors such as J.E.H. MacDonald, Albert Robson, Dr, James MacCallum and Dr. William Brodie? Family and friends such as Dr. John McRuer and Mark Robinson? Female companions such as Alice Elinor Lambert, Elizabeth McCarney and Florence McGillvray? Information will appear on the website in sequence dependent upon visitor demand. As a by-product, watch Toronto and the early 1900s come alive. I don’t intend to invent Tom Thomson but with your help, I’d like to unpack existing information about the man and his times. 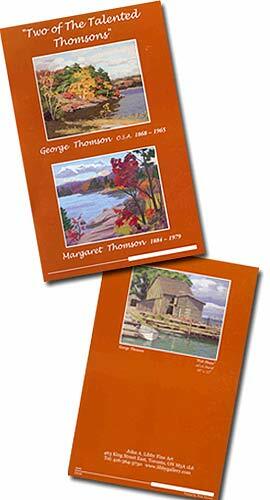 Two of the Talented Thomsons, a 12 page book with texts on George and Margaret written by Angie Littlefield, is illustrated with 36 colour reproductions of works by George, Margaret and Fraser Thomson. The book is available from John A. Libby Fine Art or through this website go to books. $10 plus tax and shipping. George Thomson was John and Margaret Thomson’s first born. He spent nine years on his grandparents’ farm in Claremont as five more children joined the family. George’s grandparents, Tam and Elizabeth Brodie Thomson, lived in the stone house across the lane from his parents’ stone house. The extended Brodie/Thomson clan participated in music evenings and exemplified a love of reading and learning. His website has more links for people to explore and some interesting essays.